I am unable to use my virtual machine on another Mac user account. 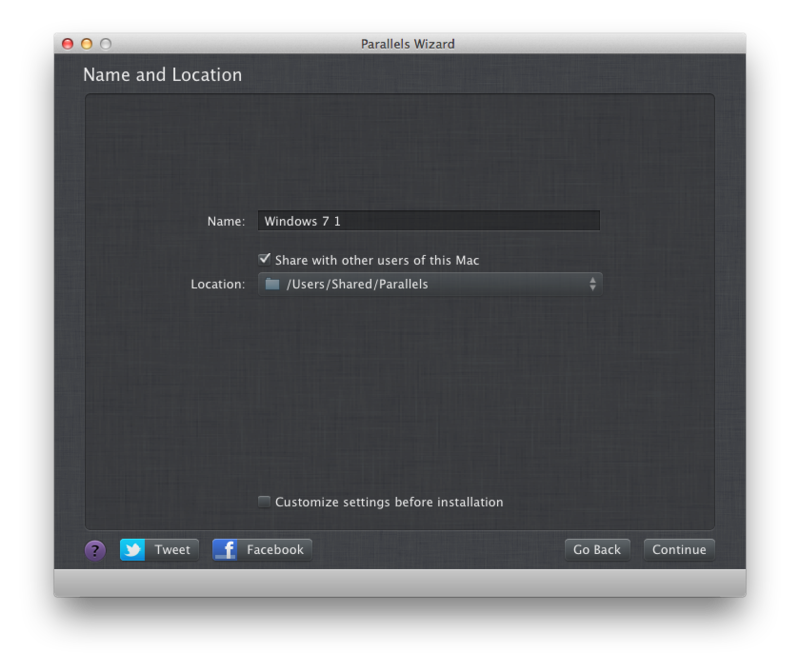 The virtual machine .pvm file is not shared among all Mac users, and permissions are not properly set. If you want to share a virtual machine among several Mac user accounts, you need to place your virtual machine in a directory which is accessible to all those accounts. The optimal variant is the /Users/Shared/ directory, where you can create a dedicated Parallels folder to store all of the virtual machine's files. Every user should have permissions to read, write, and execute the virtual machine's files. The new virtual machine will automatically be placed in the /Users/Shared/Parallels directory, and all necessary permissions will be granted to all users of this computer. This virtual machine can also be used by different Mac accounts sequentially. For example, if one user suspends the virtual machine and logs out, the virtual machine will be suspended for the next user, who will have to resume the virtual machine to continue work. When the Finder window opens, place a virtual machine's bundle (for example, Windows 7.pvm) in a directory that is accessible to all the accounts that will use the virtual machine. We strongly recommend selecting the /Users/Shared/Parallels folder for this purpose to avoid problems with insufficient permissions in the future. Once the virtual machine is moved, you will see it listed in the Control Center (Virtual Machines list in Parallels Desktop 9 and earlier) as unavailable. Click Locate and specify the new virtual machine location (the folder you have just moved your virtual machine to). The virtual machine will now be available for use. a) First, decide how you want to share the virtual machine (i.e., among all user accounts on your Mac or only among certain users). b) Open the Terminal application from Applications > Utilities. Now, press the Return/Enter key, enter your Mac user account password, and press the Return/Enter key again to execute the command. Note: Terminal does not display password symbols. Just enter your password and press Return/Enter. sudo chmod -R +a "parallels2 allow file_inherit,directory_inherit,list,add_file,search,delete,add_subdirectory,delete_child,readattr,writeattr,readextattr,writeextattr,readsecurity"
Press Return/Enter, enter your Mac user account password, and press Return/Enter again. Login from another user account to start the virtual machine.